Bringing our overseas guests for Fish Head Curry can be an amusing experience. Few of them expect just a single head and pair of eyes staring at them from the dish. As there as as many type of curries as there are Indian, Malay home and Nonya homes, you can imagine the countless ways you can cook this dish. It is as the name says: just fish head in curry. 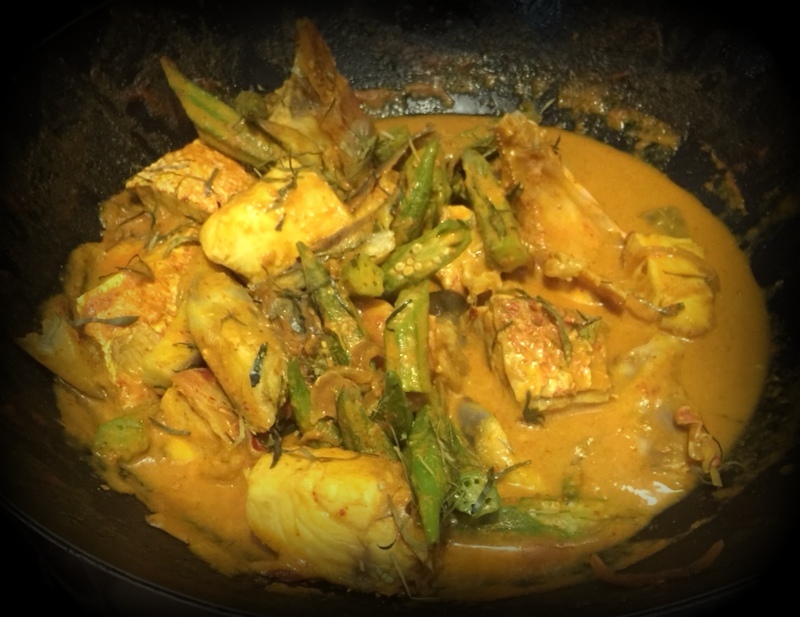 Cook your curry paste or sauce and add the fish head in. As fish cooks quickly, it is a dish that can be assembled just before serving. veg that is not mushy. Firstly, get a fresh fish head. The eyes should be firm (not sunken) and it must not emit a fishy smell, which is a big turn off for me when it comes to seafood. The wet market or reliable supermarket is the place to go. Red Snapper is widely available and generally you want a head that has meat and collagen in it. And yes, it needs to come with a nice pair of shiny "eat me please" eyes. I often use a whole or halved head, but getting it chopped up is easier for eating too, though less dramatic as a dinner presentation. Spices: Cumin, Coriander, Fennel. In this department, I use whatever I have and I often add star aniseed, Cinnamon bark and fenugreek too if I have it in store. And of course, salt and sugar to taste. To, that I add shallots/onions, ginger and garlic. As I will mentioned in the recipe below, you do the rempah first, by gently frying the blended onion/garlic/ginger paste in oil and then adding the spices and chilli. Brinjal and Lady fingers go very well with this. Tomatoes as well and if you add them, do note that tomatoes will add a sour tang and you may reduce the tamarind or omit it altogether. I prefer to blanch the veg (about 2 minutes in rolling boiling water) so that I can quickly assemble the dish just before serving and avoid overcooking the veg. I don't want to make this recipe more complex than it already is, but if you deep fry the brinjal (instead of blanching it), they keep their deep violet colour on the skin and the deep-fried brinjal taste better in the curry with its firm and creamier texture. If I am cooking a small portion, often I just add the veg and fish in at the same time. If you are confident with the timing, this dish can be done all in one move: cook the rempah, add veg, add fish. That's it. Here is my recipe below. Just get confident with this dish and there will be a myriad of ways to improve it. Dice or blend the onions, garlic and ginger. Heat up the oil in a wok or large pot. After 5 minutes, add the chilli paste, spices and asam keping. Add the sugar and salt. Gently simmer for another 5 minutes. Add a bit of water to ensure the paste is not burned. Set the paste aside or just leave it in the wok. Clean up the fish. Use some lime if you have to to remove the odour and slime. Rub some salt in. Leave aside for 30 minutes. Slice the lady fingers if they are large ones. Blanch the brinjal and lady fingers in rolling boiling water for 2 minutes and remove. Adjust the taste if you need to - salt, chilli paste. Add the fish head. In this recipe, the head has been chopped. Close the wok if you need to to ensure the fish is being cooked properly. After 5 minutes, add the veg, stir for a short while and serve immediately. If you are serving the head whole, cook it longer (10 minutes). You can choose to dress your plate with the blanched veg and just pour the curry over it. You can use yogurt or milk in place of coconut milk. I sometimes omit the coconut milk altogether and just use some water instead.